Converting from ConsignPro software to Peeps’ Consignment Software. We’ve spent nearly 10 years troubleshooting and identifying issues for consignment store owners, spending hour upon hour verifying the issue was the ConsignPro software itself, reporting the issues to Brian @ ConsignPro, and seeing nothing change. And not issues like, “This screen should be prettier!” Serious issues, like losing sales when ringing-up sales at the same time on two different computers, data corruption, and data loss. Since these issues have not been addressed, we couldn’t take it anymore – there’s only so much time you can spend on the same problems, over and over again, with nothing changing. So, we decided to fix these issues ourselves — and the fix was, writing better consignment software. We proved that in one year’s time, you can build a new consignment software system from the ground-up. We’ve given up asking why ConsignPro hasn’t done the same. Why Do Stores Convert from ConsignPro Software? The most-common reason is, stability, or lack thereof. Customers that run ConsignPro software are used to it crashing and corrupting their database, losing consignors, items, sales, etc. Or, the lack of database transactions, so they end up with inconsistent data — e.g. they rang-up sales on two computers at the same time, and stuff got ‘mixed-up’ between sales. The next reason is, the friendliness, or lack thereof. I’d say this is actually one of the bigger complaints we hear from stores that were on ConsignPro. Your cp.ini file is wiped, deleted, or renamed. Your item numbers jump up to 10 digits, out of the blue. ConsignPro locked-up during a sale and some of the items are marked as sold, some aren’t, and consignors did not receive their net. It purges/removes data every day when you close it, so you can only keep a year or two of data on file. It says it sent an email, when it didn’t. What Data Do You Convert from ConsignPro to Peeps’ Consignment Software? Consignor Accounts — Name, Address, Phone #, Email, etc. Consignor Balance — If the consignor has an open/outstanding balance, we create this balance in Peeps. Available Inventory — The item’s barcode ID, ‘Type’ (Category), Description (Brand/Size/Color), Price, Split, Store Fee/Item Fee, etc. Account Note — ConsignPro only lets you have one note on account, so it’s really just one field vs. a history of notes. We convert this note over to your Peeps’ account Notes tab within each consignor account. You can scan your existing ConsignPro software tags in to Peeps’ Consignment Software too, so no re-tagging! First and foremost, converting from any consignment software is a serious decision, not to be taken lightly. We have converted thousands of stores over the years, to/from every consignment software system on the market. We’ve seen the issues stores run into, trying to convert on Sunday and open on Monday. We’ve learned a LOT from our experience and we are the only consignment software provider on the market that has direct experience working with every single consignment software program on the market. Consignment software vendors are eager to sell you their software, but they’re no so eager to guide you through every portion of the process and ensure you are 100% ready to convert, come time to do so. The stores that have tried this and have encountered issues, call The Computer Peeps to get things back on track. So it’s a process we take very seriously and we know every portion of the process, to help ensure you and your employees experience a smooth transition. First, we install Peeps’ Consignment Software on at least one computer at your store, so you can have it at your fingertips to start kickin’ the tires. Next, after at least one to two weeks of working with Peeps’ Consignment Software, we install Peeps on your other stations and make sure employees start seriously entering accounts, items, ringing-up sales, etc. This is the most important part — i.e. everyone getting true, one-on-one time with the software, going through each of the core processes they handle on a daily basis. Last, we do at least one test conversion, so you can see your ConsignPro data in Peeps’ Consignment Software. Do You Provide Support and Training? Yes. We know the ConsignPro software inside and out and we know every portion of, “This is how you did it in ConsignPro, this is how you do it in Peeps!” We’ve been helping storeowners with ConsignPro for 15 years and we feel we know the software better than ConsignPro does — or at least we’re more honest about what its issues are. 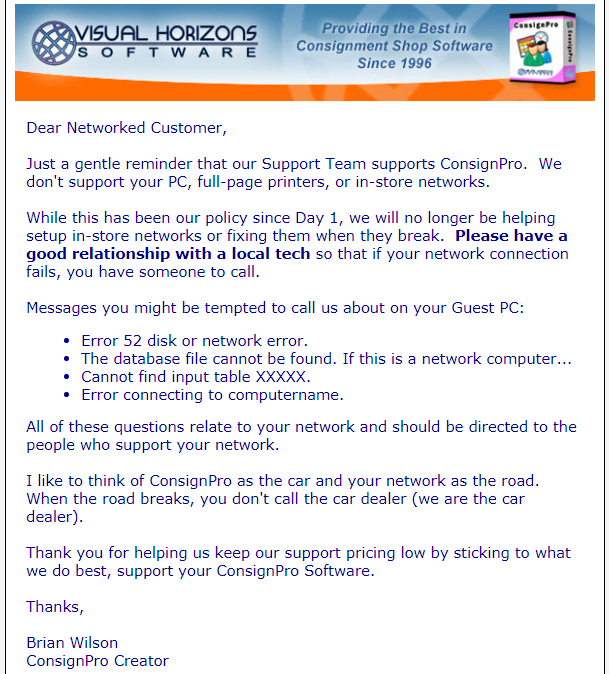 You know how Brian sends out emails gently reminding you that ConsignPro won’t help with your computer ‘issues’, your network, your printers, etc.? The Computer Peeps cover absolutely every single portion of your consignment store’s technology — we have a LONG list of references you can check that against too. 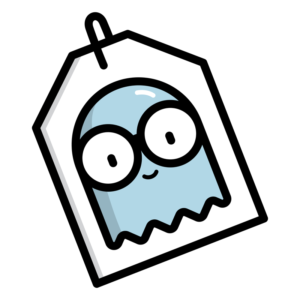 You’ll receive 30 days of Peeps’ Support and you’ll have a full 60 day trial, so you can truly, truly run Peeps’ Consignment Software in your store, before purchasing. We’re not interested in simply selling our consignment software — we’re interested in solving your store’s issues and making the tasks you do day in and day out, easier. Do You Have A Consignor Login System So Consignors Can Check Their Accounts? Yes we do! Peeps’ Consignor Login service is included at no additional charge, for stores on Peeps’ Support. We also include a full 30 day trial of this service when you convert to Peeps! Call us today @ (888) 374-5422 today to schedule a demo of Peeps’ Consignment Software and see why stores are converting from ConsignPro software to Peeps Consignment Software!